A flashback for you kids of the seventies! February 28th is National Tooth fairy Day and February is Dental Health Month and I thought I'd touch on something I bet you didn't know could be related to loose teeth. Reading Readiness. Years ago I took an excellent class on Children's Literature and Emergent Literacy. My student teacher in the class had just finished her PHD in some high falutin thing dealing with neurology and children and she spoke to us about this fabulous discovery. A discovery I thought was so cool I wanted to know more about and sadly I cannot locate anything on the web so please bear with me this is an idea, a correalation and it is pretty fascintaing. Here in the U.S. we (not all of us, thankfully) put a lot of pressure into early literacy. Parents brag about their child reading at age 3, about their infant reading and so on. What they don't realize is that it doesn't matter how early your child reads, the earliness is no indication of intelligence let it go, it is whether or not your child is READY to learn and that isn't about intelligence either, THAT is about biology and physiology and it will all click into place and your child will be none for the worse. If you are a follower of the Waldorf philosophy you will know that a prime age for teaching reading is around age 7. Did you know what else happens around age 7 and even earlier in some children? Loose teeth. There is a series of nerves that run along our upper jaw that dance all over our faces and end somewhere in the part of our brain that likes to party with abstract thought and symbol recognition. The stronger this nerve grouping gets the more able your child is to understand the symbolism in a picture, number or letter. Around age 5 when this nerve grouping really starts to strengthen (and this can happen when a child is younger also) you may notice a difference in your child's artwork. They start with the traditional hammer grip and make marks on paper or sidewalk with large sweeping motions. This brash movement falls in line with large motor skills and slowly works its way over to small/fine motor skills as your child adapts to hold her or his crayon in the pencil grip which if you notice may mirror how you hold your own pencil. As the fine motor skills develop and the grip becomes more able you will notice that the scribbles and brush strokes become shapes. People will be drawn as large circles with wavy lines to emulate limbs. This is called a mandela and children all over the world will go through this phase. Cool, no? As your child grows older, the pencil grip more firm and the teeth get looser and looser. This all corresponds to those nerves that run across the jaw and into the part of the brain that recognizes abstract thought. Think about it, you may have more than 1 child and you will notice that each child learned in their own way at their own time, did their loose teeth come at anytime relating to their artwork? Once a child's drawing of a car actually looks like a car, they have acknowledged ABSTRACT THOUGHT. Once that begins they will start to recognize that those letters that they sing about actually have more meaning then just the shape. Yes, A is for Apple but that is just a child reciting, memorizing, once they can understand that the letter A is a symbol for a sound and that each letter makes a sound and that each sound strung along with another sound can make a word...BAM! They are ready for reading. I'm not saying don't try to teach your child to read, of course you should make your home as literary friendly as possible but don't push. Children love nothing more than sharing with you and anyone who will watch whatever new talent they have mastered. Whether it is hopping on one foot, counting to 10, using scissors or discovering glue, it makes them feel good. It makes them feels secure! When a child is feeling good all the time with all this mastery, reading can prove to be a whole other piece of fruit. Reading isn't easy. A child may start hollering out letters and words he or she recognizes while you are driving down the street. He or she will pull out a favorite book and attempt to read it, jumping the gun only the slightest and they will realize that they don't know ALL the words. This can be intimidating. I remember this very same experience myself. I know of an amazingly talented and creative young man who could do just about anything but at age 8, reading wasn't easy and he lost a lot of confidence in himself. He also started losing his teeth a little later than his friends. He's 10 now and a book freak often reading well past bedtime with a flashlight aimed at the pages. People scoffed and were alarmed when I mentioned his not reading yet but really, why? There is a huge difference in learning to read, reading later and illiteracy. Force a child too soon they may just lie and pretend to read. I know of another friend who is one of the most avid readers I know and she told me she couldn't read until 2nd grade after she finally told her sister she needed some help. You are the person who best knows your child. You will guide the min the right direction I am sure. Remember, it isn't a contest, your children's skills are not trophies to show off. Each and every child is an amazing human being all by themselves, there comes a time when their amazing smiles are toothless and their noses are tucked into a book. Read Across America Day is coming up on Friday. What are you going to do to foster your child's love of reading? Me? I would get out those art supplies! It's Love Your Library Day! Check out some of my favorite books about the library! Little Pig loved to read. She made a small list of some words that caught her eye and then magic hapenned. A simple sweet story with magical illustrations, you will want to gift this to everyone you know! It's the 1950s and Louise is on her way to somewhere special. There is much that stands in her way but she is more than determined to get there! This tear jerker of a story tells of a time when our country ran by ridiculous laws and hateful ignorance couldstill produce excitement and smiles for a young girl whose very life was affected by those laws. What happens when a gang of farm animals get bored? Why, they go to the library of course! Check it out! Happy Chili Day folks! I had grand ideas and was going to whip up a batch o' chili to show off but sadly I am sick, so no sharing or showing off. Instead I will shout out some ideas I have about chili. Chili is the perfect food no matter what kind of weather you are experiencing! It is also the perfect food no matter what type of eater you are! 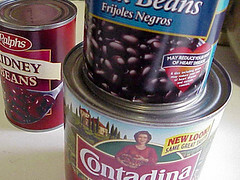 So, in honor of National Chili Day why don't you whip up a batch o' beans for your family and get the kidlets involved! What kind of bean doesn't grow in the garden? If making your chili from scratch isn't feasable you can go with canned beans and sauces and spices though I prefer the Fantastic Foods Vegetarian Chilli Mix. I never actually follow the directions on the box save for the amount of water...I add a LOT of beans though. Kidney beans are a favorite in this casa. Your kidlets can sort the cans you are using by size. They can measure the outside of the cans with a piece of string or ribbon and then using a ruler they can measure the piece to see what the circumference of each can is. Or if your kidlets are a little older, pull out that tape measure and let them have a go. Ask them which can they think is larger or heavier. What shape is the can? What shape is the box? Need some time to yourself? Send them on a shape treasure hunt around the house and ask them to count how many soup can shaped items they find. If you use the mix, your kidlets can help measure out the water needed. Are they old enough to operate a can opener? Let them have a go! Everyone can be involved when it is chili night! Save the box from the mix and your older kidlets can cut out pieces to make their very own robots and creatures. Wash out the cans and make tin can telephones or if you have giant cans, make tin can stilts. You can even have a day of assembling chili in a jar gifts for friends and family! Fun! I use the recipe on the back of the Albers box, cutting the sugar a little and using rice milk instead. It is soooo good with rice milk! How About a Pancake Song? It is addicting but has a good beat and you can dance to it! Happy Pancake Day folks! It's all repeats these days, originally uploaded by squacco. This fantastic batch o pancakes was made by flickr user squacco! I wish I could make pancakes as pretty as these! 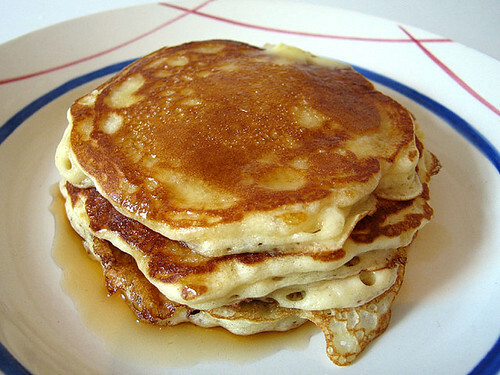 Today is Shrove Tuesday aka Pancake Day! *Have savory pancakes for dinner. Set up a pancake bar so kidlets can add their own toppings. *Have a "pancake shape" hunt through the casa. How many pancake shaped items can your wee ones find? *Make happy flapjack dolls! Cut out round pieces of felt for your kidlets to decorate stitch to a backing, have the wee ones stuff 'em, seal the mup and vioula! Happy Flapjacks! If your kidlet can use scissors have him/her cut out their own shapes. Kidlets as young as 4 (sometimes even 3) can weild a large needle and thread themselves so assist them with the sewing up of the flapjack. If you don;t feel crafty enough for some sewing with your kids, try using construction paper, paper plates or other paper and seal the flapjacks with tape or staples. The kidlets can still stuff them with cotton, tissue, old socks, etc. OR, for an added small motor skill element, use paper plates that you have hole punched around the rims and have your kidlets lace their Flapjacks closed! Who knew pancakes could be so mathy? Don't forget to check this list for some stories you can read! **if you live in the staes and decide to eat out, IHOP has a "free" pancake offer of sorts, check 'em out! A little pancakey goodness and some donation good deeds, what have you got to lose? It's the year of the golden pig and a very special year indeed! Read more about Chinese New Year here! In honor of the year of the pig and because I am at a loss for another activity to write about at the moment (I'm sorry, but Shrove tuesday has been sucking up my brain!) here are a couple of book recommendations! What better love story than the one of a pig in love with a chicken? Seriously sweet and perfectly charming this book is one of my top top favorites. The illustrations make we smile and even bring a wee tear to my eye when Leon finally tells Albertine he loves her. He does it his way and it is perfect! Another beautiful tear jerker! This is the story of a young Chinese girl who wants nothing more than to go to school! It is New Year's and the lucky envelopes are being passed around and everyone is sharing their wishes, will Ruby's wish be granted? Based on the life of Shirin Yim's grandmother this story is a must have for any library! I love Grace Lin! She is fabulous, sweet and even keeps a blog! Her illustrations are delightful and her stories featuring an American Chinese family are familiar. While the culture may be different from yours (or not) the feelings of fun and excitement are much the same! Check out all of her books! *Pick up some blank paper lanterns and have yer kidlets paint, collage & decorate them. *Try some green tea and almond or fortune cookies! *Bake your own fortune cookies! 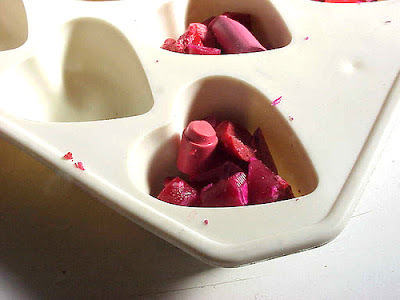 *Gather an assortment of anything and everything pink and make your own pink pigs. I've done this with kids and they have created three dimensional, tissue paper, painted, collaged & beglittered pigs! In honor of this New Year's make golden pigs! 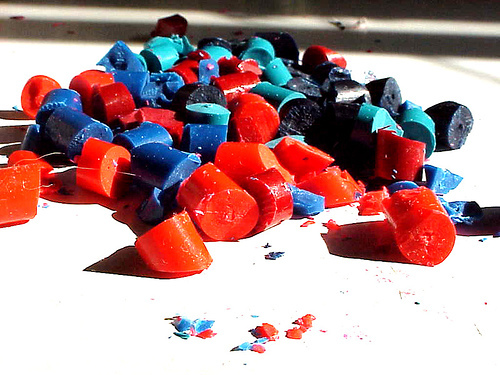 *make some party cracker fireworks! Just what you need to hold all those Valentines your kidlets made for you. Fun, easy and age adaptable, pull out some lunch baggies and go to town! *anything else you can think of for decorating! 2. 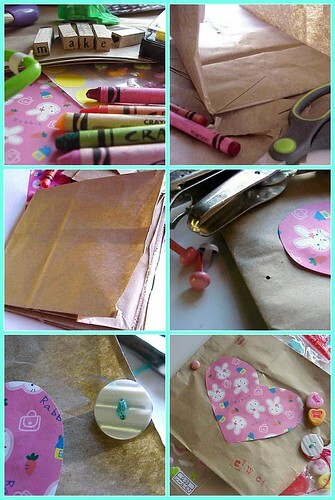 Cut out the bottoms of 3 or more paper bags. This may be frustrating for younger kidlets so you may want to start the cut for them and of course do all the cutting for wee wee kidlets. 7. Stuff and take a looksie! You can use regular grocery bags to make BIG books to hold your kidlets artwork. 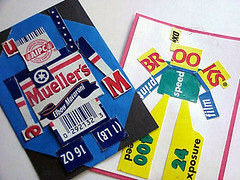 You can also moit the removal of the bottom and bind the bags together to make a LONG book. Paperbag books make for great storage of flat collections. Make it a family tradition to make a book at the end of each summer to comemmorate the year. Make a book because it is fun...you don't really need a reason, do you? Who wouldn't want a tiny trinket box full of lurve! 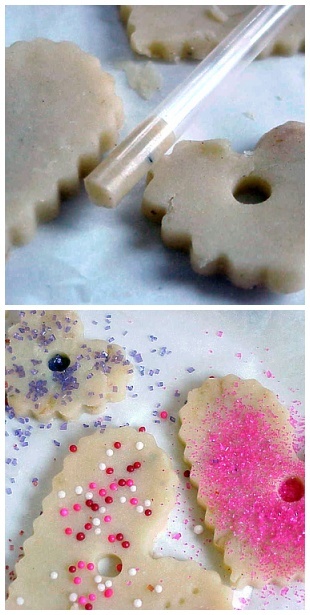 This project is easy, addicting & adaptable for all ages. Take a peek! See? Super fun! You can use these boxes for all sorts of niftiness! 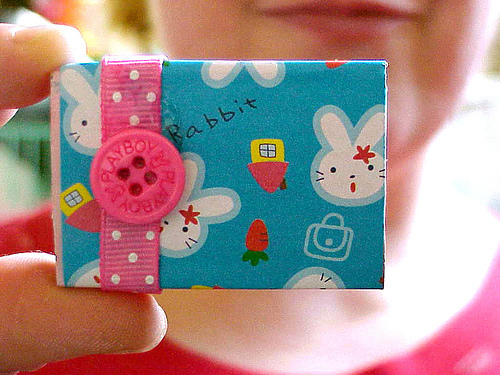 They can be tiny tooth catch-alls for the toothfairy, a secret place to hide notes of adoration for your children, a storage box for fortune cookie fortunes or a great gift box to present to friends and family when filled with other handmade goodies! Older kids and teens can get fancier by stitching away on scraps of fabric, ironing on to some sort of stabilizer so the threads won't unravel. I use Yes! paste on my fabric boxes so that there are no clumps or glue stains. Do you have a jar full of old mismatched costume jewelry? Use a pair of pliers to twist off clip on earring backs and glue onto the box with super strong E-6000! Younger kids can paint directly onto the boxes and or glue feathers and pom-pons to the outside or you can have them paint on regular paper and use strips of that for the outside. So many possibilities! If you decide to make one or two, send me a picture and I'll feature it right here on the Do! 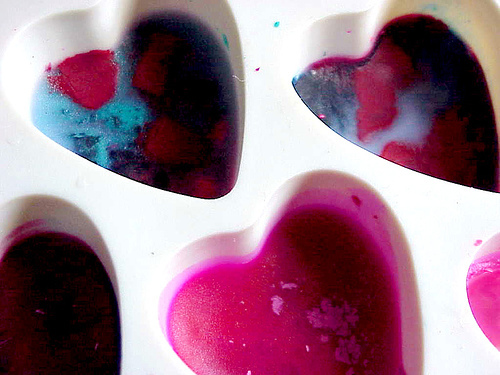 With this nifty project you can RAK someone AND send them some Valentine's Day cheer! 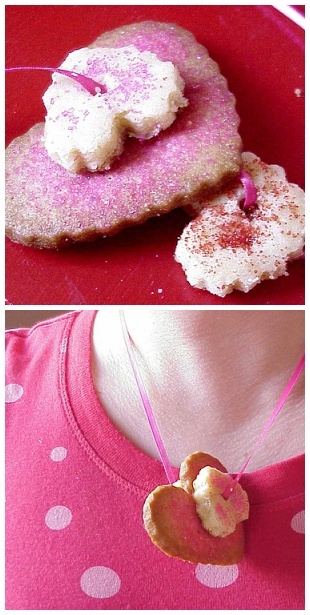 Introducing Shortbread Necklaces! If you are pressed for time, store bought sugar dough will work also, maybe even better but the shortbread is a bit tastier! *additional seasonings like cinnamon, ginger, black pepper to taste...go to town! Mix the butter and sugar first, add the vanilla and spices next then the flour. Kidlets can do the first part with a wooden spoon and mix in the flour with CLEAN hands. It is like play dough, they will LOVE it! Once the dough is mixed, loosely wrap it in a floured dishtowel or wax paper and stick it in the fridge for about 10 minutes to firm up. Roll it out on a floured surface and let the fun begin! 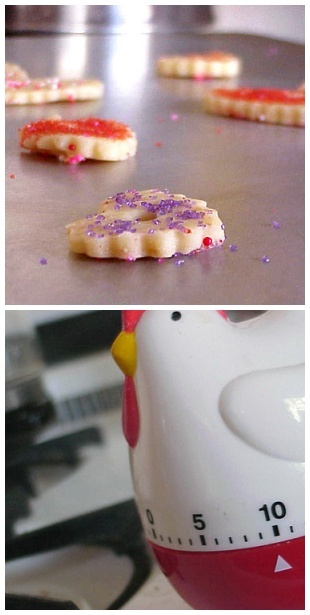 Add your sprinkles and whatnot...you can even have yer kidlets "paint" the dough with food color if ya like and then "punch a hole in the center of the cookie using a straw. Remove from the oven, allow to cool. If the holes have closed up a bit you can widen them using a chopstick. Be gentle. the warm shortbread is pretty delicate. 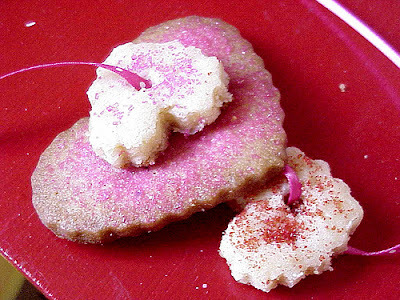 Once the cookies have cooled, thread 2 or 3 onto a skinny ribbon, red & white twine or a licorice whip. Wrap 'em up in a trusty chinese take-out container that has been decorated by yer wee ones and deliver pronto! You may want to make extra's for yourself..these cookies are YUMMY! 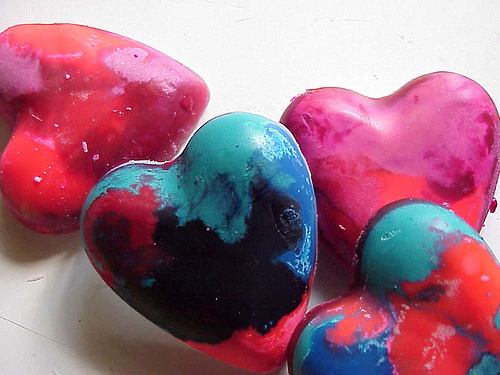 Stay tuned all week for more lurvely crafts for you and yer wee ones! "How Kind" is a perfect tale of how one good thing leads to another. The story starts out with Hen giving Pig an egg and Pig feeling just so dandy about it that he gives a little something to Rabbit and so on and so on. With brilliantly colored illustrations and the repitition of "How Kind! ", yer kidlets will need little encouragement to come up with kind ideas of their own. Take a cue from the book and spend the week dialoging with yer wee ones about Random Acts of Kindness. Do something nice for a neighbor, bake cookies for a dear friend, donate old toys to a local charity or take a walk with sidewalk chalk and spread some colorful cheer. The possibilities are endless and being a smilemaker is a good thing to be! For more fun things to do check out my Kaboodle Page! 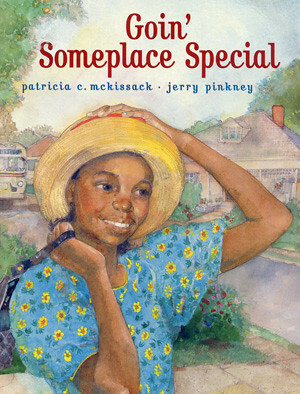 In honor of Neighbor Day I thought I would share with you one of my most favorite books ever! Okay, I know I say that about all th books I write about but this book is truly sweet, special and perfect for sharing with your kidlets. It is a bit on the sad but sweet side but I have read it to three year olds who really amazed me with their compassion and ideas on the story. The added plus is that it is about one of today's most popular crafts...knitting! I don't even know if it is still in print and my copy is a paperback but I love it all the same. Everyday on the train as Mr. Nick travels to work, he pulls out his knitting and knits alongside his train neighbor Mrs. Jolley. One day Mrs. Jolley isn't on the train and then another day comes when she isn't there and another and another. Mr. Nick finds out that Mrs. Jolley is in the hospital and is very sick. 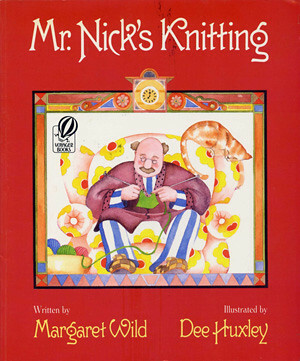 MR. Nick decides to knit up something extra special for his neighbor and dear friend. What he makes is most beautiful and inspiring. You can use this book as a sounding board for yer kidlets and have them make their own creations. No knitting necessary. A paper quilt will work also. A wee bit more fun can be found over on Kaboodle. Have fun and don't forget to Wave All Your Fingers At Your Neighbor today! February 7th is "Wave all your Fingers at Your Neighbor" Day. I like to call it "Howdy Neighbor Day!" So, without further ado I bring to you an idea for a nifty gift to make for your neighbor or anyone else you feel the need to say "howdy" to. All craftiness here is do-able for kidlets of all ages and of course can be vamped up for us grown-ups. Surprise your neighbor with a felty doorknob hanger. I used to make these for my teachers when I was a kid and yes this was in the seventies. I apologize for not having a template for you but I am not quite the computer savvy dilly girl but I'm sure you are all cafty enough to make up your own. I kind of winged mine but you may want to play around and draw a template first on scrap paper. Regular sized printer paper works well. I often use pages from magazines I'm tossing for patterns. Orientate your paper so that is it horizontal and mark out about 4 1/2 inches or so from one side and cut into a rectangle. From there you can create a keyhole shaped (or not) pattern for your felty piece. Have fun! limit your supplies to your kidlet's age and what they like best to use. Only put out what they can handle and of course you do all the scissor work if they are really young. Cut out your basic shape and cut a small X into the top of your felt piece. This will be where you slip it over the doorknob. The remaining area is where your kids can go to town. Decorate to your heart's content. Kids can paint, glue and/or sew their design on. Set aside to dry and sneak it onto your neighbor's frontdoor when they aren't looking with a little note about how they make your day better. Everyone loves a little love. Wouldn't you?